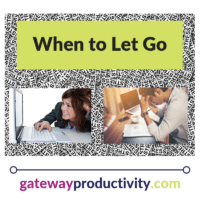 If you find yourself constantly putting out fires and reacting to what is happening rather than taking proactive action, you likely need to consider how you can delegate or outsource some of your workload. For entrepreneurs, this is especially important because you need the time to work ON your business, to do the high value, big picture work that will help you grow, rather than being stuck working IN your business. What do I love doing in my business? What do I hate doing in my business? What high value tasks do I want to spend more time on in my business? Which tasks can be delegated to an employee or outsourced? Who can I delegate/outsource these tasks to? If you know what tasks you want to outsource but are struggling to find the right person, ask other business owners you trust (like us!) if they have a resource to share. Good luck letting go.